The “Files” section of cPanel is your go-to spot for uploading files, backing up your website and managing your file transfer protocol (FTP) accounts. FTP is a way of managing the files associated with your website – whether that means uploading, reading or retrieving them. 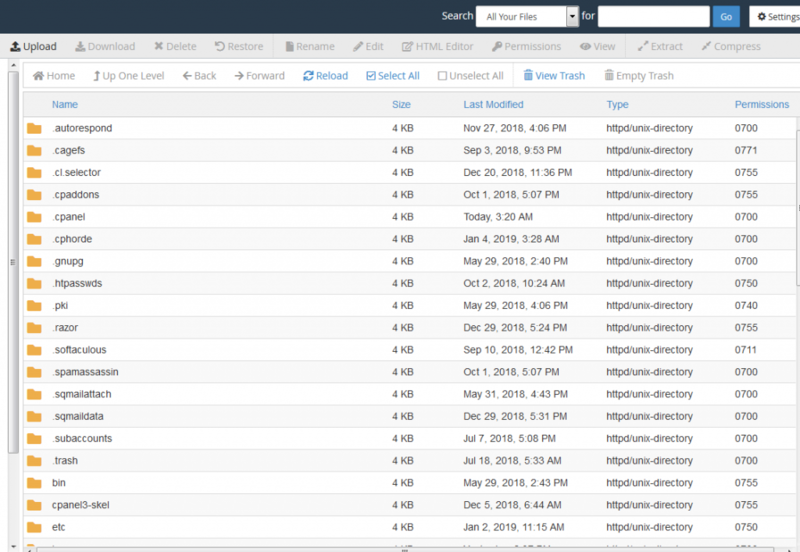 The first space you’ll want to get acquainted with in this section is the File Manager. The File Manager allows you to manage all of your site’s files directly with HTTP instead of having to use an FTP tool or other third-party apps. This is where all of your site’s files are stored, therefore you’ll want to proceed with EXTREME caution when making changes here. Then, in the middle of the screen, you’ll see the contents of whatever folder you have selected (including the folder’s sub-folders and files). Folders help you keep all of your files organized, making your site’s structure easier to understand and maintenance much more straightforward. You’ll then be asked to name your new folder and enter the destination where the folder will be created. When you’re done, click “Create New Folder”, and you’re set! To add a file – for example, a word document you want people to be able to download, or an image you want to use on your site – you’ll first need to click on the folder where you want to upload to. You’ll be asked to drag and drop the file you want to upload, or simply select the file.